NASA’s Juno spacecraft has been busy orbiting Jupiter and providing fantastic new views of this giant world, something not possible since the previous Galileo mission. While almost flawless so far, the mission has had a few hiccups recently. Juno entered safe mode just shortly before its next close flyby of Jupiter this week, apparently the result of a software performance monitor inducing a reboot of the spacecraft’s onboard computer. The spacecraft is otherwise healthy and Juno is conducting its own software diagnostics to determine the specific cause of the problem. 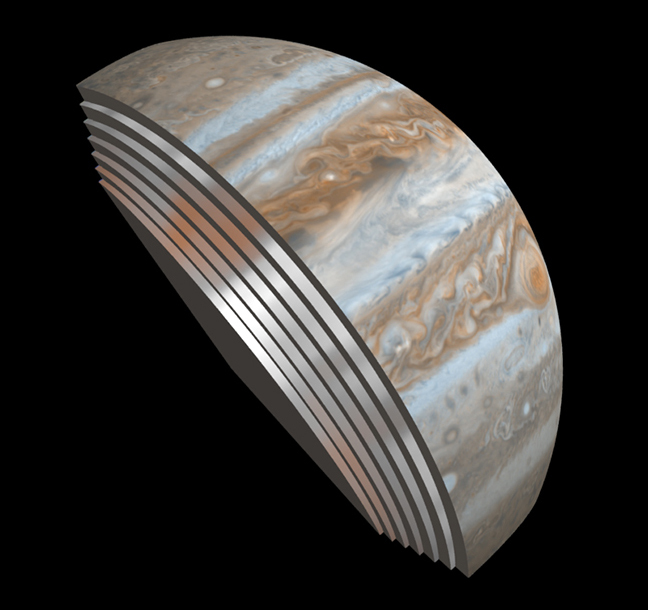 Before this, Juno took its first observations deep into Jupiter’s turbulent atmosphere. The onboard computer rebooted successfully and high-rate data is still being sent back to Earth. Typically, a spacecraft will enter safe mode if its computer detects an anomaly in the general conditions of the spacecraft. It is more of a precaution, so that engineers can assess the problem. Juno turned off its scientific instruments and other non-critical components, but is otherwise healthy with its solar panels still facing the Sun. It is expected that the situation can be remedied soon, as happens in most cases such as this. 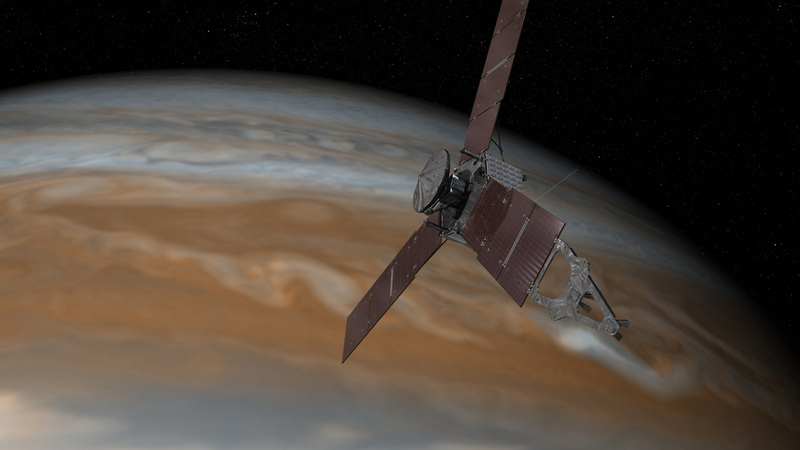 Juno first entered safe mode on Tuesday, Oct. 18, at about 10:47 p.m. PDT (Oct. 19 at 1:47 a.m. EDT). The spacecraft conducted its close orbital flyby of Jupiter on Wednesday, Oct. 19, but because it was in safe mode at the time, no science data was collected. 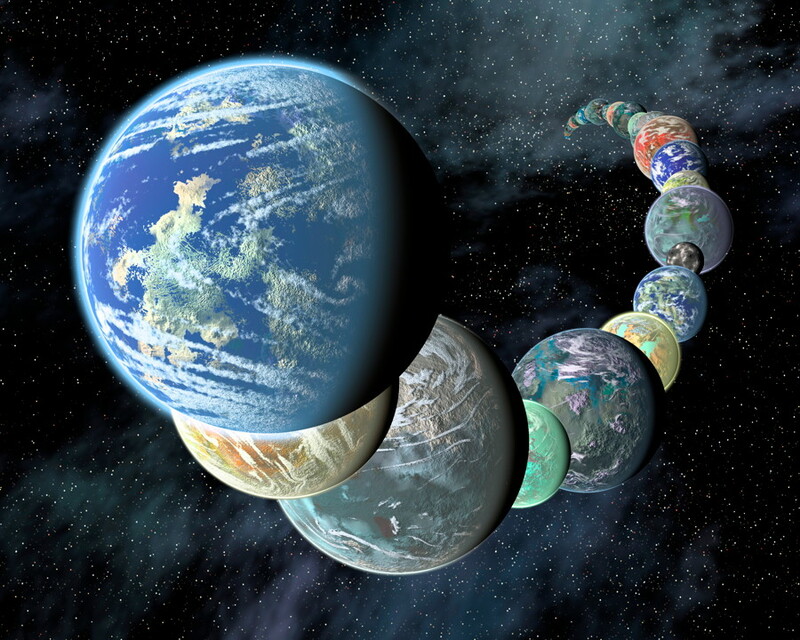 The next close flyby is scheduled for Sunday, Dec. 11. Despite the glitch, Juno has already been sending back a wealth of information about Jupiter. Most recently, it viewed the planet’s highly active atmosphere by peering beneath the cloud tops with its Microwave Radiometer (MWR) instrument; using its largest antenna, MWR can “see” about 350 to 400 kilometres (215 to 250 miles) below the top cloud deck. The upper atmospheric belts and bands which the planet is famous for are also visible at that depth, it turns out. Juno has another camera for taking “regular” photos of Jupiter called JunoCam. It is a public outreach camera, meaning that the public can download and process the photos into final image products. This is the first time such a camera has been used beyond the asteroid belt. These images can be used to help create public and media interest in the mission. As reported previously by AmericaSpace, Juno also recently provided beautiful new views of Jupiter’s north and south poles, in both visible light and infrared. The infrared images were taken by the Jovian Infrared Auroral Mapper (JIRAM) and show energetic polar aurora in unprecedented detail. “These first infrared views of Jupiter’s north and south poles are revealing warm and hot spots that have never been seen before. 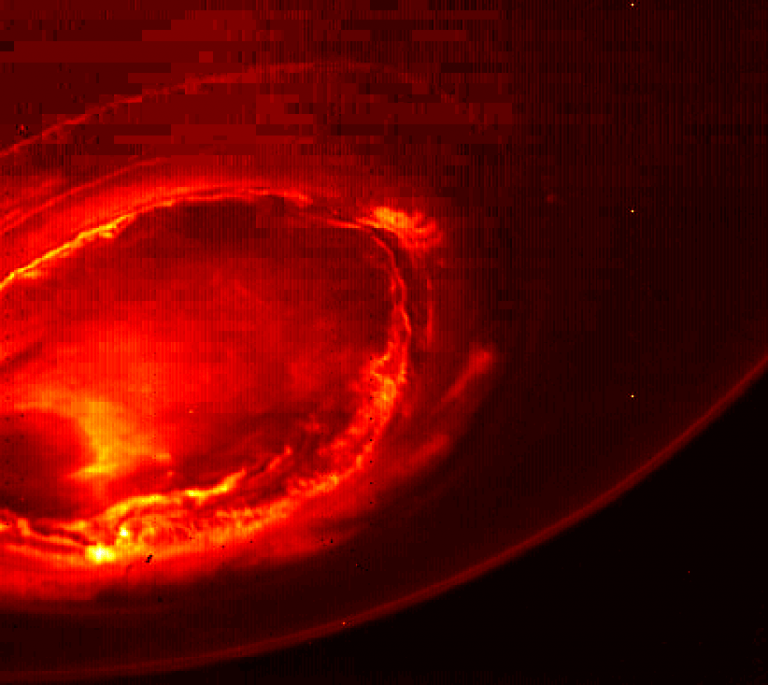 And while we knew that the first-ever infrared views of Jupiter’s south pole could reveal the planet’s southern aurora, we were amazed to see it for the first time. No other instruments, both from Earth or space, have been able to see the southern aurora. Now, with JIRAM, we see that it appears to be very bright and well-structured. The high level of detail in the images will tell us more about the aurora’s morphology and dynamics,” said Alberto Adriani, JIRAM co-investigator from Istituto di Astrofisica e Planetologia Spaziali in Rome. While Saturn has its famous “hexagon” pattern of clouds at its north pole, Jupiter instead has a lot of smaller circular storm eddies, like hurricanes on Earth but much larger. There are no prominent cloud bands like those seen at lower latitudes. 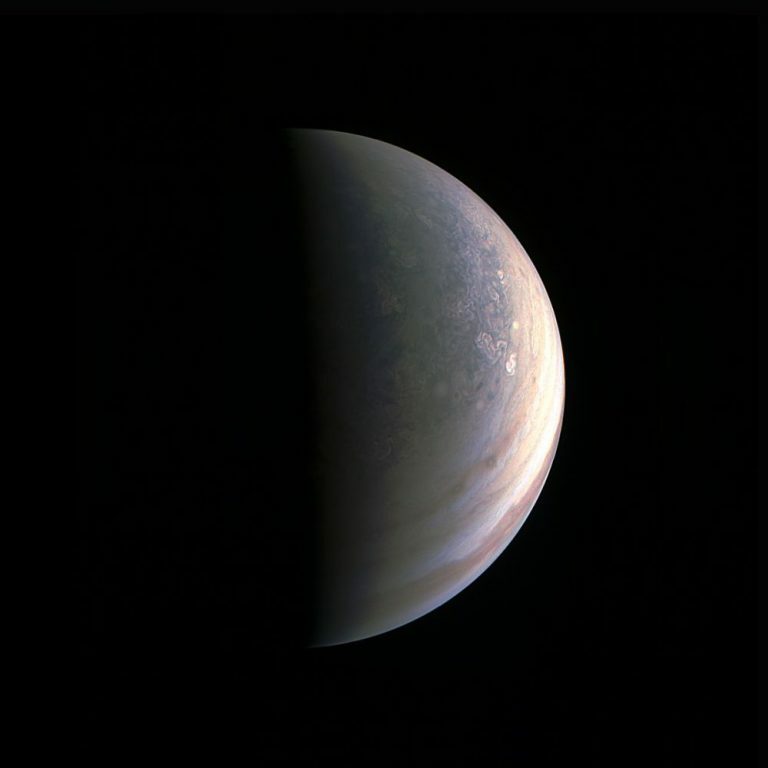 The first clear images of Jupiter’s north pole were obtained by the Pioneer spacecraft in 1974. That mission, however, consisted of only a single flyby with less images. Juno is orbiting Jupiter and will take many more images than ever before. Juno will make a series of 37 planned close orbits of Jupiter; during the first one, it came within 4,200 kilometres (2,500 miles) of Jupiter’s cloud tops. Juno first arrived at Jupiter on July 4, 2016. This was the first return to Jupiter since the Galileo orbiter mission, which arrived at Jupiter back on Dec. 7, 1995, and lasted until 2003. Before Galileo, the Voyager 1 spacecraft made a single close flyby of Jupiter on March 5, 1979. Juno is the first solar-powered spacecraft to fly to the outer Solar System, first breaking the distance record on Jan. 13, 2016, and the first spacecraft ever to fly with 3-D printed titanium parts. It is also the first time that a spacecraft has orbited so close to Jupiter, beneath the deadly radiation belts. The main objectives of Juno’s mission include: investigate the existence of a possible ice-rock core, determine the amount of global water and ammonia present in the atmosphere, study convection and deep wind profiles in the atmosphere, investigate the origin of the Jovian magnetic field, and explore the polar magnetosphere. Juno will use nine scientific instruments to accomplish all of this, in what will be the most detailed study of Jupiter ever conducted. More information about the Juno mission is available on the NASA website.